Riffing on Hill Canton's post on thieves yesterday (or whenever, given the incubation period of posts around here, it may well be December of 2176 before these pixels see the light of day) I decided to post my own rant on thief abilities. What are the odds, buddy? One of my many grievances with thief abilities is that success is almost never influenced by conditions. That is, no matter how well concealed the trap is or how alert/inert the guards are, your chance of detecting it or bypassing them remains the same. * Sure, the DM can modify a trap or lock and say "your -20 to open it" or whatever, but it's so specific and granular that it becomes a nuisance and only dickheads ever use this method except in the odd extreme circumstance. In an ideal world, conditional difficulty should be part of the system so the DM doesn't feel like s/he's rewording the Old Testament just so that the lock to the crypt can be a little tougher to open than the lock on your sister's diary. It should be easy for the DM to assess difficulty without taking a lot of time, rather than trying to decide whether it's a -22% penalty or a -24% penalty, it should be broad enough that the DM can make a decision quickly and we can all get to the matter at hand: slaughtering orcs and stealing their treasure. Climbing a sheer, polished, monolithic wall: you're a thief not Spiderman. Some of you who are more statistically gifted than I are probably thinking "Why not just tell the dudes they've got a 75% chance to defuse an Easy bomb or 40% chance of deciphering a Difficult language or whatever?" You could do this if you have a good idea of the odds of success for every thief ability under a wide variety of circumstances. I don't have that info handy, nor do I trust myself to make up reasonable odds for such on the fly. The beauty of the Pile o' Dice system is that as a DM I don't have to think very granularly about the odds of success, I let the dice do the dirty work. Yes, on average a 1st level thief has a ~58% chance of hiding in a 3d6 shadow, fine. But, as DM, I don't actually have to say that. Instead, I'm saying "your odds are somewhere between 20% and 95%, but are most likely somewhere in the middle, so let's just see what happens here..." This is probably just my laziness but I find it much easier to assign a range of probability than a single, precise value. * The exception here being picking pockets of leveled characters, of course. Which clearly was a reaction to those dickhead players who insist that it is their thief's moral obligation to steal from his colleagues mid-dungeon, yet get indignant when their moronic character finds himself hogtied and naked while his erstwhile colleagues offer his carcass to a band of gnolls in exchange for free passage through their domain. *** 5% if you abide by the 20 always succeeds rule. I know, I'm being inconsistent here. **** I loathe the word adjudicate as used by gamers--though I don't deny it's usefulness. Still, I hope you appreciate the personal pain I am submitting myself to in order to deliver this post to you. If you're like me and love leaving things to the dice, this is great! I'm going to ask the obvious question: if I implement this system, what do I do about thief levels? (MUCH) less important, should dexterity or race modifiers apply? Thief Level, if I get your meaning, wouldn't apply directly to thief abilities; i.e. 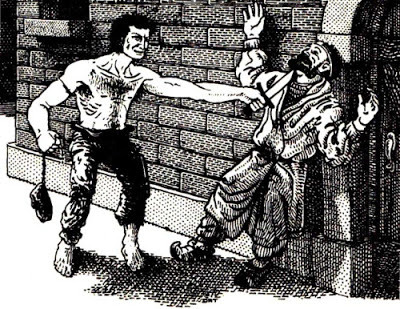 a 9th level thief would not add 9 to his dice unless the PC had elevated the ability in question to level 9 over the course of his or her career. Would Dex and race adjustments apply? I'd say sure, why not. I haven't playtested any of this so if you see a flaw, let me in on it. Anyway, let me know it this addresses your question. Or, more importantly, if it fails to. Bloody well bookmarked for later printing out and including in my private rulebook. This has the further beauty of allowing you to let other classes try the same things: except they only get a d12/10/8/whatever, and no bonuses. Good luck!